Peter Hendricks has built his life on ‘doing’ words. 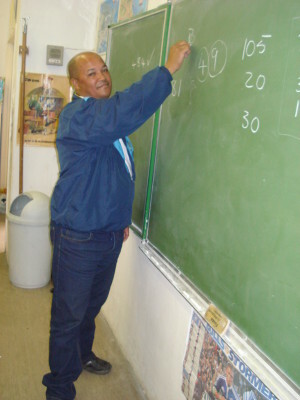 At age 45, the school caretaker obtained his teaching degree from the University of the Western Cape – working two jobs to realise his dream of empowering his community from the inside out. After two years of looking for a job, Hendricks decided to make his own. “I went to a local high school to ask if I could help out – and the principal said yes,” he explains. “So I helped out by answering phones, looking after classes when teachers weren’t there and was involved in setting up their computer lab.” Nine months later he found a contract job as a cleaner at a local primary school, which he followed up with a full-time job taking care of the grounds at a school in Ottery for the following two years. “You get pushed around with some people looking down on you, but being a cleaner is honest work that puts food on the table,” shares the father of two, who credits his family for encouraging him when things got tough. In fact, he says one of his proudest moments was hearing his little girl shout ‘Go daddy’ when he went up to collect his degree at his graduation ceremony last year. Still working as a caretaker until he can pay off his outstanding fees for the release of his Post Graduate Certificate in Education (PGCE), Hendricks is looking forward to inspiring even more youngsters to find their own abilities – both inside and out of the classroom. For now, he’s looking forward to working off his tuition fees so he can finally take up a full-time teaching post – and sharing with his students the journey he’s taken so far. Because, while it may have been said that ‘those who can’t do, teach’, Hendricks wants his community to know that it’s those who do, that can. Bravo Peter! You are blessed and a blessing to people (like me) and learners who will cross your path.Many doors of positive challenges in your calling; are awaiting you. It’s your privelege to open them. Just the best for you my friend and colleague!